As a part of my ongoing series featuring guest authors' reviews of genealogical institute courses, my friend Patricia McIntyre shares her experiences with the "Writing Logical Proof Arguments" course at the Virtual Institute of Genealogy Research. REVIEW of "Writing Logical Proof Arguments." By Michael Hait, CG. 1 & 8 November 2014. Virtual Institute of Genealogical Research (http://vigrgenealogy.com). Yet another opportunity has come forth to become a more educated genealogist. Imagine attending a genealogical institute with four 90-minute lectures by a noted expert on the topic, complete with syllabus materials and a recording of each lecture. Now imagine having all of this in the comfort and convenience of your own home. No travel and hotel costs included. This is the objective of the Virtual Institute of Genealogical Research, found at http://vigrgenealogy.com. The Virtual Institute is newly formed and has webinar-style classes in a variety of topics that are scheduled through September of 2015 at the time of this writing. J. Mark Lowe, CG, FUGA, will present the next institute series titled, “Preparing the Field: Understanding the Agricultural Records of our Ancestors.” This particular institute will be held on the 24th and 31st of January 2015. Others are scheduled on an almost monthly timetable. Besides Mark Lowe, presenters include Maureen Taylor, Donna Moughty, Blaine Bettinger, Billie Stone Fogarty and Rick Fogarty, Melanie Holtz and Melissa Johnson, Paul Milner, and Angela Packer McGhie. The home page for the Virtual Institute of Genealogical Research promotes that each institute course will include six hours of instruction, syllabus material, “practical exercises,” and a personal copy of the recordings of the classes for use afterwards. This would be helpful if you have to miss a session or if you would like to study the material again. The Virtual Institute courses are priced at $69.99. For many of us who are used to free webinars, this may seem a little steep. But, if you have ever traveled for training at an institute or conference to be taught by experts of their field, this is very reasonable, not to mention convenient. The first offering by the Virtual Institute was presented by Michael Hait, CG, and titled “Writing Logical Proof Arguments.” The course was broken down into four 90-minute classes. The first, “Principles of Logic and Arguments,” blended the Genealogical Proof Standard element of “a soundly reasoned, coherently written conclusion based on the strongest available evidence” and the philosophical style of arguments, not to be confused with what we as genealogists commonly call proof arguments. Michael taught us, in a very understandable format, the standard argument form, what a complex argument consisted of, and the difference between a deductive and inductive argument. Next, he moved on to the types of inductive arguments and what were considered logical fallacies. All the while, Michael related this knowledge to genealogical proof and the GPS. The second class, “Dissecting a Published Proof Argument,” used an article that Michael Hait had authored and had been published in the NGSQ called “Parents for Thomas Burgan of Baltimore County, Maryland,” (National Genealogical Society Quarterly 101 (2013): 19-33.) We had all been asked after registration to read and become familiar with the article. During the class, we were able to analyze the premises that were formed to lead to the conclusions. Individuals in the class were given time to ask questions using the “Go To Meeting” format. During the week, between the two sessions, we were given homework using evidence that Michael had gathered on a particular family. We were to use what we had learned in the first two classes and develop one proof statement and one proof summary. The exercise was beneficial and helped solidify the new concepts of logical thinking. As with most educational experiences, the more you put into it, the more you benefit. The next Saturday, the classes were “Turning Evidence into a Logical Argument” and “Putting Your Argument into Writing.” The instructor used the homework assignment to show us his method of organizing the premises or evidence to come to conclusions, which when built one upon another, become the coherently written conclusion that is a part of the GPS. The last class of the course gave examples of different forms of genealogical writing, where to find examples of those forms, and some principles of good composition and writing. Michael Hait used The Elements of Style by William Strunk, Jr., and E. B. White as a resource for this information. At the conclusion of the classes, I felt that my participation in the institute course had been time and money well spent. Michael Hait had taught me a new way to look at proof arguments and proof summaries using logical thinking. As I read my next NGSQ article, I was able to see the premises and conclusions built one on another. A new sense of literary construction was understood – a light bulb moment, if you will. I had hoped for more time spent on the actual process of writing of the article and organization of it, but came away having learned something far more important. 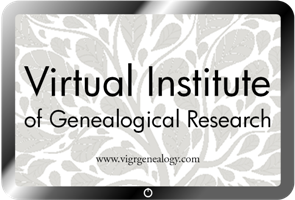 I would urge any genealogist who wants to learn – which should be everyone - to check out the new offerings on the Virtual Institute of Genealogical Research website. Board for Certification of Genealogists, Genealogy Standards, 50th anniversary edition (Nashville, Tennessee: Ancestry.com, 2014), 1-2.